This unique equine photoraphy adventure is for anyone who yearns for nature and, longs to reconnect with horses through the lens of a camera in an authentic Tuscan farm setting during the wonderful Autumn wine harvest. Don’t miss out on this special weekend package with one of the best equine photographers in the world! Christiane Slawic will be at Castellare di Tonda to run her world famous photography workshop, give talks and be available to answer your questions. You will leave with a portfolio of new photos (focused primarily on horses, but inclusive of other wildlife and landscape), first-hand knowledge of equestrian photography. Attendees will stay at Castellare di Tonda guest lodge and enjoy meals cooked by our gourmet Tuscan chef as well. Don’t wait to reserve your spot for this one-of-a-kind event! This is a sell-out workshop. Space is limited to 12 participants. After this workshop you will look at horses in a different light. Christiane will teach you methods and techniques to help you learn the tricks of the professionals, step by step. Professionals and amateurs welcome. Christiane has a degree in education and she knows how to present complicated facts in a way that is easy to understand. Before photographs are taken Christiane gives her participants insights into the best lighting, camera angles, camera settings and how to make the most of the location. During the shooting Christiane will assist with helpful information on how to create a good shot and how to capture the horse in motion. Her eye for horses and her talent to take perfect shots of her equine models will amaze you. 14th September. Arrival with time to relax by the pool. You are invited to a introductory dinner with Christiane Slawik at our restaurant at 7pm. 15th and 16th. theory, experimental portrait shots with different colours and backgrounds, lunch in the restaurant together, again theory and liberty shots,sunday morning we riding photos with different stiles and horses,western themed photos, Tuscan themed equine pics etc. You will be taught professional photo composition and theoretical techniques while capturing equine portraiture, horses at liberty and performance horses under saddle. Christiane explains how to work with your camera and discusses her preferred lenses and camera settings. She illustrates the connection between aperture and exposure time and gives advice on manual focusing. Previous knowledge is helpful but not required. Extra nights accommodation are available from 92 € per night for a classic two bedroom appartment. Add on a few days to make your trip even better, enjoy some great Horse riding and Spa treatments. Requirements: Interest in horses and the art of equine photography! Equipment: Digital camera, Laptop with imaging program. We are very excited to host award-winning international equine photographer Christiane Slawik in September for a one week riding and photography holiday combining art, wellness (at our own spa) and horses. Christiane combines the joy of photography , artistic inspiration with her passion for horses. Her dynamic, emotional photographs have that distinctive trait and are exhibited on more than 100 title pages and in more than 20 calendars all around the world every year. In 2008, her latest book ‘Horse: A Portrait’ (by Willow Creek Press) received the Benjamin Franklin Award for the ‘best animal book’ in the US. In addition to the popular motifs requested by publishers and customers, Christiane Slawik – as opposed to many of her colleagues – offers her clients and audiences ‘that special something’. Horse-owners or breeders as well as the participants in her photo workshops are thrilled by her infinite know-how, passion and creativity. The photographs will touch your soul! Come discover who is the woman behind the lens – and take part in active and interesting shoots throughout our 280 hectare Chianti wine farm, with our fantastic selection of 52 horses. Meals will be taken at the restaurant together, and one afternoon is reserved for a trip to Volterra. Ride as much as you like, or enjoy spa treatments, massages or simply time by the pool. The Fjord horse, also called the Vestland – was developed by Norwegian farmers which needed a small, strong, hardy and sure-footed horse for working the demanding ‘Fjord’ area as far north as Alaska. This breed is one of the oldest and purest in the world, and have similar markings to the prehistoric horse. 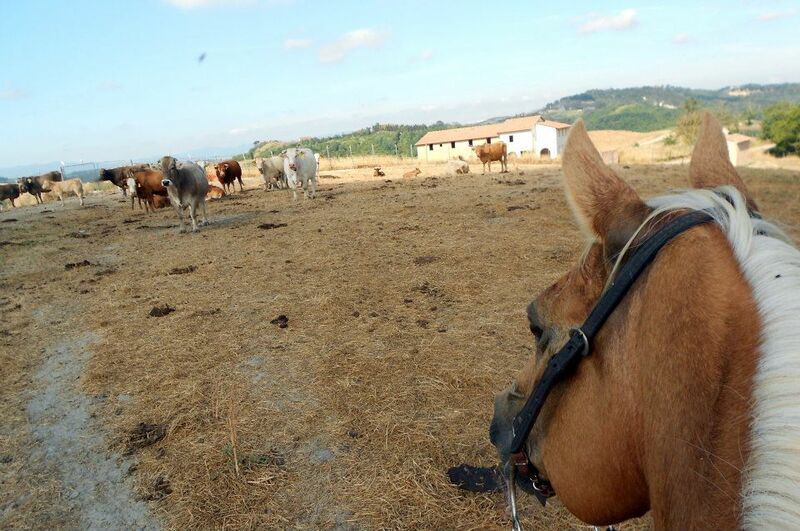 These traits were necessary for their use in farm and logging tasks, and those same traits make them excellent trail horses now here at Castellare di Tonda, Italy. The three horses above, Grosso (the biggest), Otto (the cheeky one) and Josy (the little one) are three of our most popular lesson and trail horses. Above is Rosso, the red dun of the team. 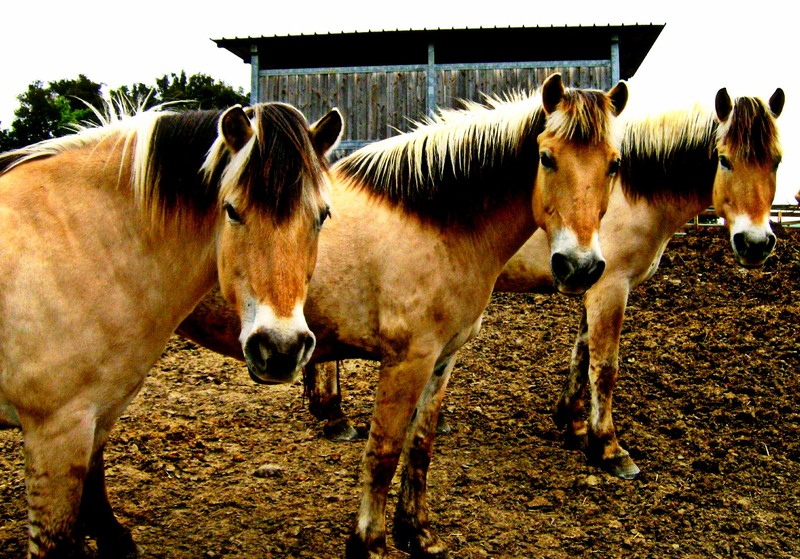 Fjord horses come in 5 ‘wild’ shades. Red dun, Yellow dun, Grey, Uls dun amd Brown dun. 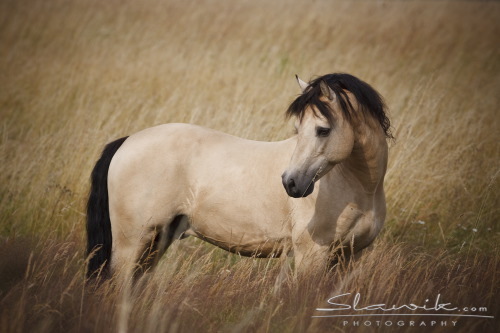 These colors are all common in wild horses of Central Asia, the Przewalski, the Tarpan, the European wild horse. The Fjord horse has primitive markings such as zebra stripes on the legs, and a dark dorsal stripe that runs along the back and through the mane and tail. These horses were used by the Norwegian military in both the first and second world wars, and were legendary in battle – carrying loads on treacherous terrain that no other horse could. I can only imagine how those forces must have been attached to their pack horses. 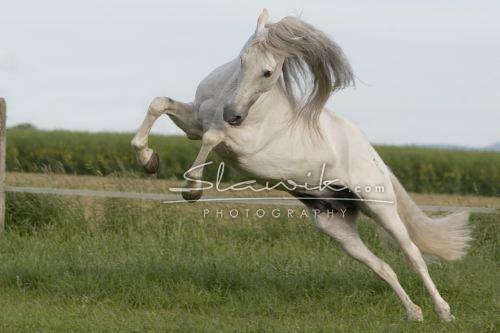 The character of the Fjord is extraordinary, and to me quite similar to another old breed – the arab. 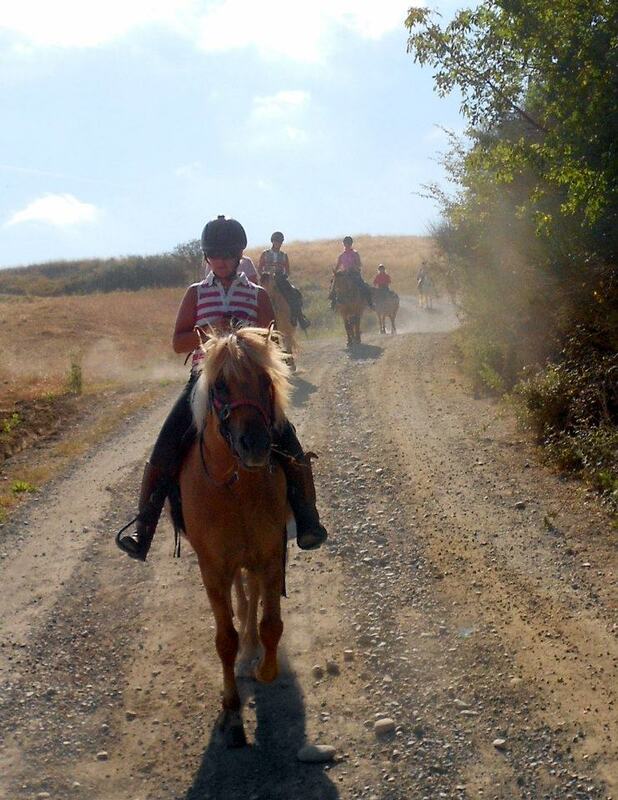 For sure their legendary sure-footedness and endurance makes these little horses the perfect mount for hilly Tuscany. Come try one for yourself !!! 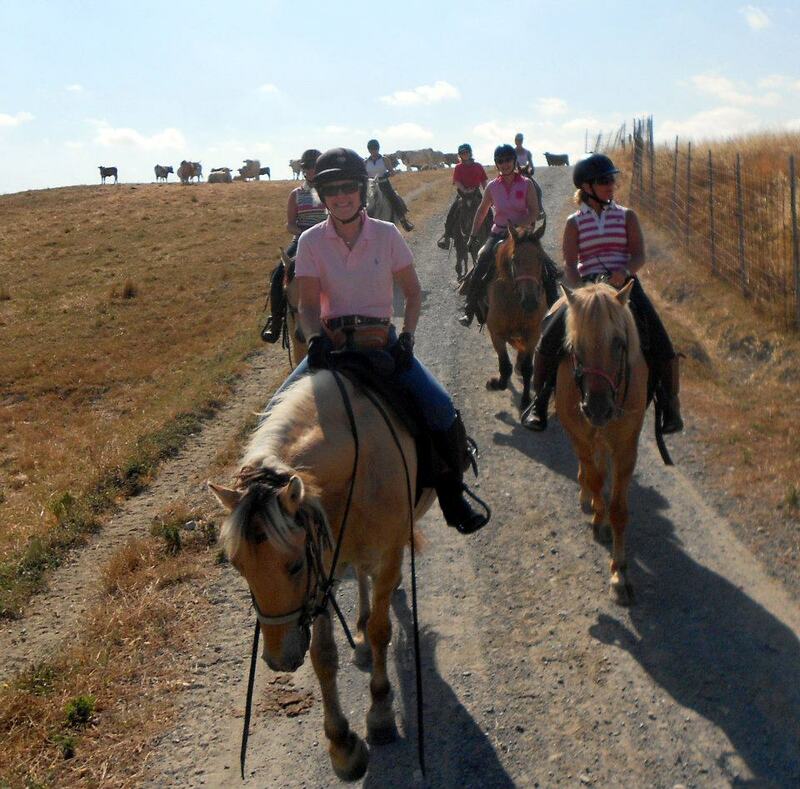 Here are a few pics taken last week with our In the Saddle group from Yorkshire- a friendly and hardcase group of ladies (and a couple of men) that travel throughout the world on horseback together, and this time their location was Tuscany! The weather here has been hot. Scorching hot. So hot, that we had to depart at 7am every morning to avoid the heat of the day. The above ride was one of the hardest in the heat, as their was virtually no shade in the hills underneath Toiano (in the Pisan region of Peccioli). The landscape was alluring in its own way. Sunburnt tufo trails, golden fields of freshly baled hay, and cattle grazing throughout the valley. Above are the pics of the cattle when we passed through. My horse Last (the quarter at the bottom) didnt have that famous cow sense his breed is famous for – and chickened out when we needed to move the cattle. No worries though. Cant go through them – but can go around them. The horses were all super chilled, even little Mascerone (who Ailsa was riding at the back, and who has just turned 4). Castellare di Tonda retreat is an ancient collection of farmhouses spread over300 hectaresof pristine countryside near the medievalvillageofMontaione. 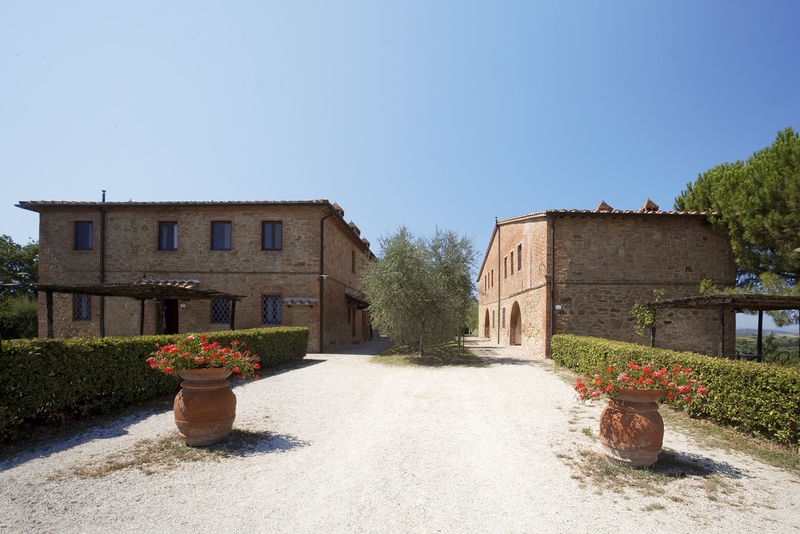 The farm is enviably located in the heart of Tuscany, only an hour from the three historic art cities of Pisa, Florence and Siena and offers horse riders an authentic eco-friendly holiday experience; staying in restored farmhouses on a real working Chianti wine estate. The farm also produces olive oil and honey, and breeds quality quarter and paint horses for competition and trail riding. The estate is equipped with modern comforts such as Wifi internet, a wellness clinic and spa, restaurant and bar and a selection of sporting activities such as tennis, golfing range, and children’s mini club. 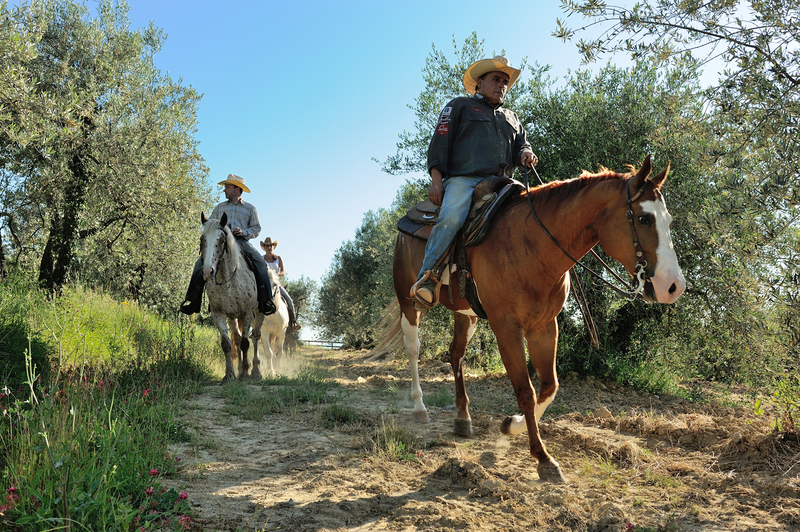 At Castellare di Tonda, the horseback riding is excellent. Whether you’re a complete beginner or an advanced rider looking to tackle some ‘real’ riding, there is a horse and a challenging ride for you. 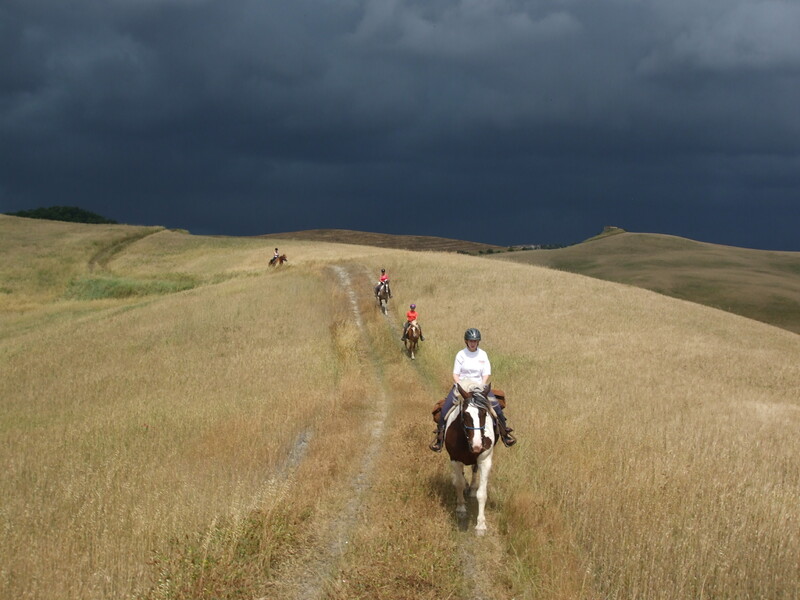 Riders can enjoy magnificent trail riding and expert tuition in the indoor or outdoor school. The horseback trails pass through cattle farms, enchanting forests, past lakes, castles and natural spring waters. For the ultimate combination of nature, authenticity and luxury, Castellare di Tonda ticks all the boxes. This working wine estate offers a wellness spa where you can treat yourself to some pampering, excellent Tuscan wine and food, authentic farmhouse accommodation and one of the best equipped equestrian centres inEurope. 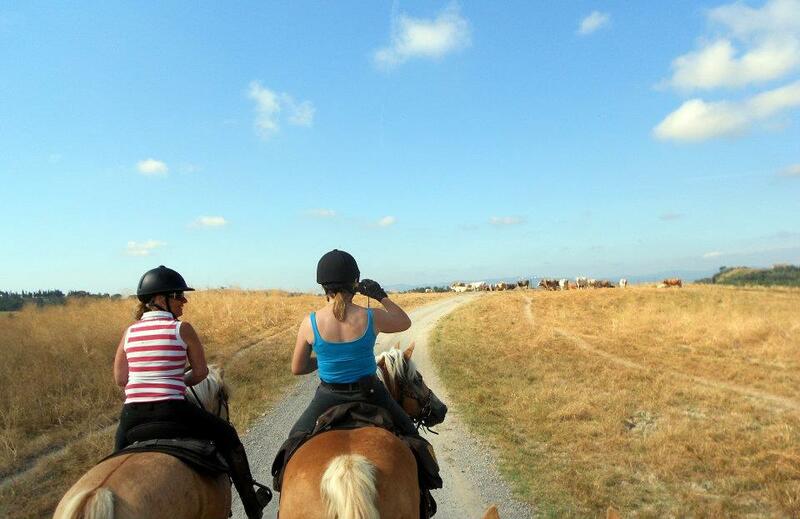 Special horse riding packages are available from September through to the end of November 2012 at the incredible price of 950 euro per person (based on double share). These exclusive packages include 7 days meals and accommodation in the Fornace or Castellare farmhouses (located in the heart of the estate next to the restaurant, stables and wellness spa), 5 half days horse riding to a different location every day, and one hydro circuit entrance at the wellness spa. Contact info@castellareditonda.com for more information on dates and availability. An african heat wave has made riding a challenge the past fortnight. Last week the temperature soared up to the late 30’s, and the formerly green fields are now looking decidingly ‘cooked’. Last week we had a group of 12 English riders here, who are experiencing the opposite weather back home (constant rain). On arrival it was decided that since we are experiencing African weather, its best to ride like we are in Africa. Many of the group had in fact done riding safaris in South Africa, and they agreed (if not a little wearily) that a 7am departure was the best idea. Aside from that rude awakening of an alarm at 5am, riding out early is actually wonderful. The ground is still slightly damp, wild animals can still be spotted grazing in the open, and the horses are perky and happy to be outside. Last week we rode through Chianini cattle farms near Sughera, through the mysterious and enchanting estate of Castelfalfi, and far out to the San Vivaldo monastery (a long ride at almost 4 hours, but well worth it). In the evenings we rode up to Riccardo and Ruths art workshop, and down to the Carfaldo natural spring waters. It was a full on week, but due to the early and late starts, horses and people were spared the stress of the extreme weather and finished the week on a good note. Here are a few pics of us out at the end of June enjoying the (then) green fields!